GLOBAL AWARENESS 101 - Let your VOICE be heard and get involved. OUR future depends on it! : How Will I Know God’s Answer To My Prayer? How Will I Know God’s Answer To My Prayer? “My grace is sufficient for you” (2 Cor. 12:9). When He answers yes, it’s easy to say, “Praise the Lord!” But when He says otherwise, we have a hard time finding reasons to praise Him. Sometimes we don’t take “no” for an answer, and we keep praying! Or we look for a reason why He didn’t answer our request. But Scripture never says God will give us exactly what we ask for every time. He is sovereign. He has the right to say “no” according to His infinite wisdom. Oftentimes, it’s for our protection. Sometimes, God wants to answer our prayer, but the timing isn’t right. As I reflect on my life, I realize that if God had answered certain prayers according to my schedule, I would have missed His best in every single case. He may have been waiting for me to grow spiritually in some area so that I could more fully experience the blessings He had in store (Eph. 1:3). Again, He is sovereign, and His timing is perfect. God also answers “My grace is sufficient.” We may pray for years, yet our circumstances remain unchanged. God seems unresponsive and heaven is silent. In many cases, the problem isn’t the length, intensity, or nature of our prayers. Oftentimes, God is up to something we don’t know about, something much bigger than we were expecting. Something that may require a different answer than the one we anticipated. But rest assured that if God isn’t removing your particular “thorn,” His grace is sufficient. By an act of our will, we can decide to trust that God knows what He’s doing, even when there’s no logical or rational explanation for our circumstances. The Father is not offended when we ask, “Why?” But He’s overjoyed when we trust Him, even though He may choose not to explain. God always answers the prayers of His children. As we learn to pray, we will learn to discern His methods. There shall come a breath and the breath shall bring the wind. And the wind shall bring the rain and the rain shall bring the floods. And the floods and the floods and the floods shall bring the torrents and torrents and torrents. So shall they be saved like falling leaves from the mighty oaks, swept up by a hurricane in a great forest. Arms and legs shall come down from heaven and there shall be no ebb. What do you fear? “Lord, what is the truth about who You are in this situation?” I don’t believe fear, I believe God. I don’t believe doubt, I believe God. I don’t believe shame, I believe God. I don’t believe depression, I believe God. I don’t believe despair, I believe God. 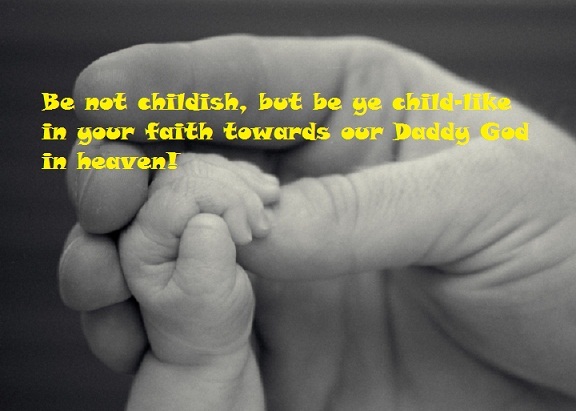 I believe YOU, Daddy (Abba)! I believe your Kingdom and your reality supersedes this one. I believe your Truth is the only Truth there is and that your Truth sets me free. I believe you when you tell me I’m yours, I’m special and I’m valuable to you. I believe you approve of me as your child. I believe I’m the apple of your eye. I believe I make you smile. I believe I carry your infinite goodness in my heart. I believe peace reigns in my innermost being. I believe joy is my constant companion. I believe hope prevails. I believe love wins. I believe I’m alive to make a difference and my life does just that. I believe my belief in your sovereign goodness and I doubt my doubts. I believe you’re the best Daddy in the world, the universe, and the cosmos!! I believe I’m a wanted child held in your arms for eternity. I believe I am blessed and highly favored every day of my life. I believe you are on the throne and everything is working towards a brilliant fulfillment that you have planned before the world was created. I believe nothing can or will change the Truth as you declare it to be. Nothing I do, and nothing I don’t do, will change the timeless Truth of your love, your grace, your mercy, your tenderness, your compassion, and your ability and desire to care for me and for each and every child of yours alive on the earth or alive in heaven. I’m alive for these Truth encounters. I’m alive to love well. I trust you, Papa! I trust you, Jesus! I trust you, Holy Spirit! I love you, Daddy (Abba)!